Nerf Arcade is a high-energy, fast-paced game that sees players grab hold of two oversized Nerf Blasters and shoot as many targets as possible to win tickets or reach a high score. 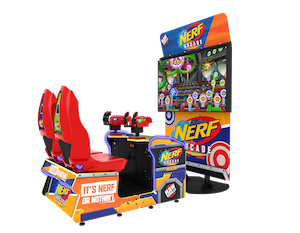 Nerf Arcade features a 65ins commercial-grade LCD screen, two patented Blaster guns, seats, and a 500w sound system. LED lighting effects and a vibrant cabinet artwork complete the design. “With four exciting levels and skill-based play, it's no surprise that income reports have been consistently at the top of every test location,” said Raw Thrills in a statement. The game is expected to ship by June 2019.